A stone built end terraced villa with bay window, south facing garden and parking for two or more vehicles. Location Crossland Road runs from Sheffield Road down to Oddfellows Road and onto Station Road, no more than a few hundred yards from the village centre which has plenty of good local amenities, which include several churches, post office, a couple of banks, a number of hostelries together with a superb fruit and vegetable shop, butcher and an excellent delicatessen. 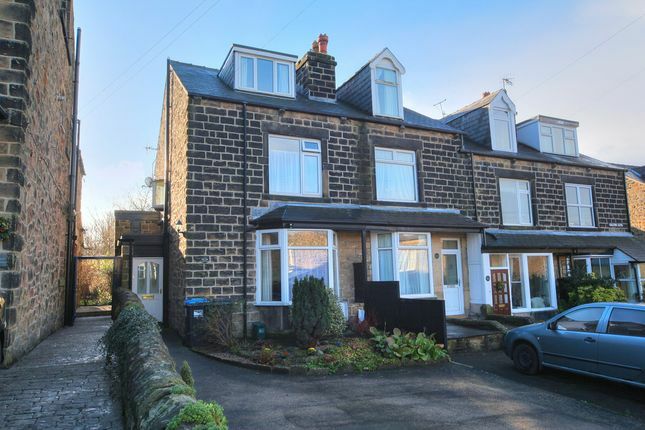 There is a village primary and junior school which leads to Hope Valley College and there is a broad range of recreational facilities in Hathersage including, during the summer season, the open air swimming pool. The train station is within easy walking distance with regular service links to Sheffield and Manchester centres and there is also a regular bus service to and from Sheffield centre. The village is surrounded by glorious countryside of the Peak Park and lies some ten miles to the south west of the centre of Sheffield. dining room with stairs rising to the first floor and rear facing window having a pleasant southerly facing view over the garden. The dining room itself features plenty of space for a family sized table and chairs and a door leads to a generous understairs storage cupboard with shelving and hanging space. Downstairs utility/cloakroom with W.C. And corner wall mounted wash basin. There is space and plumbing for a washer dryer with extractor fan. Breakfast kitchen this rear facing breakfast kitchen has splendid southerly views overlooking the garden and the hills surrounding Hathersage including Offerton and Shatton Moor. The kitchen features a comprehensive range of fitted wall and base units with roll edged worktops. Fitted features include a double oven with extractor hood above, fitted fridge and dishwasher. Tiled splashbacks, breakfast bar and glazed display cabinets complete the room. A side door giving access to the rear garden. Sitting room the front facing bay windowed sitting room has a pleasant view of the hills surrounding Hathersage, coving and an original rose to the ceiling. The focal point of the room is provided by a living flame gas fire with a marble fire surround. From the dining room stairs rise to the first floor landing with doors to all principle first floor accommodation. Bedroom one a front facing master with a beautiful view of Stanage Edge. There is an extensive fitted wardrobe with hanging and shelving space. Study/office featuring an oriel shaped window, plenty of fitted shelving and space for a work station. Family bathroom the generous fully tiled family bathroom includes a sunken corner bath with shower attachment, oversized pedestal wash basin and a low flush w.c. There is a rear facing window overlooking the garden and a cupboard houses the Vaillant combi central heating boiler with pressurised system. This room also has underfloor heating and a laundry cupboard. Stairs rise to the second floor landing. Bedroom two is a front facing double with dormer window having fantastic views of Stanage Edge and Hathersage church. This room features fitted eaves storage and wardrobes. Bedroom three is a rear facing single bedroom with fitted wardrobes and pleasant views of the hills surrounding Hathersage. Outside To the front of the property is parking space for two or more vehicles, in a double driveway, where a lit path in turn leads to the entrance porch. The south facing rear garden features a raised terrace with plenty of space for table and chairs. Steps lead down to a shaped lawn flanked by well stocked mature borders and a small fir tree. There is a large ornamental pond abutting a stone wall with trellising and a further patio gives access to a gate leading to the adjoining recreation ground. The rear garden also has a timber shed. The south facing orientation ensures sun virtually all day long. General information These particulars have been prepared by the agent, and subsequently approved by the seller. Please note no survey has been carried out and no appliances have been tested. It is recommended that any prospective buyer carries out their own checks prior to completion. Viewing Strictly by appointment through elr Hathersage Office . Offer procedure Should you wish to make an offer, please contact our elr Hathersage Office on , where full details, including financial information, will be requested. Free valuations and marketing advice: Thinking of selling? Ring elr on Sheffield to arrange an appointment for one of our experienced valuers to advise on your sale. RICS homebuyer surveys & other valuations Our RICS Qualified Chartered Surveyors have in-depth experience of reporting on all types of residential property throughout the region. Phone for further information. Mortgages and financial management elr have on hand advisors at the Mortgage Advice Bureau to help you find the best mortgage deals for your needs from First time buyers; Remortgage; Buy to let; Moving home – deals which in some cases are not available direct. There will be a fee for mortgage advice. The actual amount you pay will depend upon your circumstances. The fee is up to 1% but a typical fee is 0.3% of the amount borrowed. Contact any elr branch for details.